We're getting closer to the promised late 2017 free-to-play relaunch of Battlerite and the first step has just been made with Battlerite Lite. 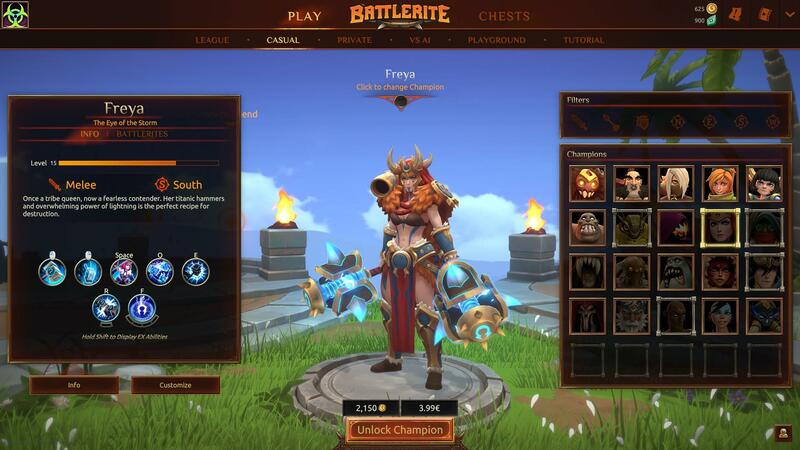 Today, Stunlock Studios has just revealed this early version of Battlerite free-to-play, which will be available later this week. Battlerite Lite gives you access to six champions, while the others have to be unlocked with Battle Coins or real money (see image below). The rest of Battlerite remains the same and you can, of course, buy Early Access to get the full roster. The definite F2P version of Battlerite will offer one champion for free (Jade) and have a few more in free rotation. If you're already wondering where you can get Battlerite Lite, hold on! To begin with, Stunlock Studios will hand out two keys to every Early Access player who has verified their email address on their Battlerite account and signed up to the newsletter. With these keys any player will be able to play Battlerite during Early Access and beyond. For the complete details on Battlerite Lite and what the studio is planning for the official free-to-play release, read the blog post.